The casino operator’s big dividend looks tempting, but it could be a high-yield trap. Las Vegas Sands (NYSE:LVS) recently posted a 10% year-over-year revenue drop and a 33% decline in adjusted net income during its first quarter due to a slowdown in gaming-related spending in Macau, its biggest market. Tighter regulation of casino and junket operators, a crackdown on corruption in China, and an economic slowdown across the country have all caused casino operators to lose their luster. Shares of Las Vegas Sands have fallen 15% over the past 12 months while shares of its rival Wynn Resorts (NASDAQ:WYNN) have declined 22%. Rendering of the Parisian Macao. Image source: Las Vegas Sands. Las Vegas Sands' decline caused its forward annual yield to rise to 6.4%, which is much higher than Wynn's 2.3% yield. However, that hefty yield could be slashed in the near future for four simple reasons. 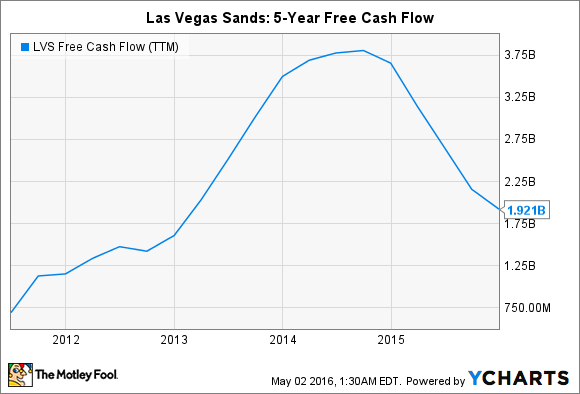 Las Vegas Sands paid out nearly 100% of its free cash flow over the past year as dividends. This means that for the dividend to keep growing annually -- as it has for three consecutive years -- its free cash flow must rise for the payout ratio to drop to sustainable levels. Unfortunately, Sands' FCF has been falling over the past few years due to the aforementioned problems and the construction of new properties. On the bright side, Sands' FCF hasn't plunged to negative levels like Wynn's. That's why Wynn cut its dividend 67% a year ago. At the time, founder and CEO Steve Wynn declared that it would be "foolish to issue dividends on borrowed money." But speaking of borrowed money, Las Vegas Sands finished last quarter with $9.51 billion in debt, compared to $9.24 billion a year earlier. 92% of that debt matures between 2018 and 2020, which gives Sands some breathing room to turns things around, but if the Chinese market deteriorates over the next five years, it could struggle to pay off that debt. This makes spending billions of dollars ($1.9 billion over the past 12 months) on dividends seem wasteful. Sands also funds buybacks with debt, with $1.56 billion remaining in the current buyback authorization, although it didn't repurchase any shares during the first quarter. The company bought back $2.44 billion in shares since June 2013 -- which has also been a wasteful strategy since shares fell more than 20% during that period. But it's not just dividends and buybacks Sands needs to worry about. It also needs strong cash flows to keep expanding. The opening of the Parisian in the second half of the year should generate higher cash flows by boosting its Macau room count by 31%, but Sands still has big plans for expansion -- including two other future developments on the Cotai Strip and potential resorts in Japan and South Korea. It's unclear how Sands can accomplish that with falling cash flows, rising debt levels, and unsustainable payout ratios. During last quarter's conference call (as transcribed by Thomson Reuters), chairman Sheldon Adelson noted, without any clear monetary figures, that the company spent "an enormous amount of money on capex" but that it "had a very large amount of money scheduled to keep things in good shape." Adelson declared that the company "will continue to return excess cash to shareholders while maintaining our ability to invest in new development opportunities." That statement is puzzling, since Sands doesn't have enough excess cash to return to shareholders and invest in new developments. Las Vegas Sands' earnings aren't expected to improve anytime soon, even with the Parisian's opening factored in. That's because the Parisian will be opening in a very soft market -- Sands' overall gaming revenues fell 13% annually last quarter, with revenue at all four of its Macau properties reporting year-over-year sales declines. Meanwhile, Wynn, MGM Resorts International (NYSE:MGM), Melco Crown (NASDAQ:MLCO) and Galaxy are all expanding with new properties -- which brings more players into a stagnant market. CLSA analyst Aaron Fischer recently forecast that annual gross gaming revenue will rise by just 1% this year, while Macau Chief Executive Fernando Chui estimated that total casino revenues would fall to $25 billion in 2016 -- its lowest level since 2010. As a result, analysts now expect Sands' earnings to decline nearly 4% annually over the next five years -- an ominous sign for future cash flow and dividend growth. Las Vegas Sands' 6.4% yield looks tempting, but it has all the red flags of a high-yield trap -- sluggish earnings growth, declining cash flows, high payout ratios, and fuzzy promises from the management. I suspect that if conditions worsen for Sands, the company will follow Wynn's lead and dramatically slash its oversized dividend.